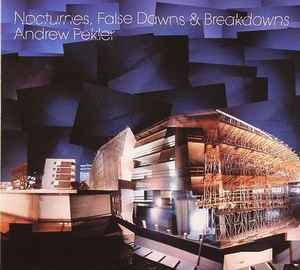 Andrew Pekler's NOCTURNES, FALSE DAWNS & BREAKDOWNS, starts calmly enough, with the twinkling of "Here Comes The Night...," but "Arches" then quickly dives into a dark, angular jazz. "Nocturne 1" thrums in the corner, while "Wait" drifts quietly with its shuffling beat, until "Soft Dissolve" brings a touch of exotica to the mix. Indeed, this album seems particularly suited for nighttime listening, with its mellow vibe and slinky production. "Nocturne 3" gets more abstract, however, with its melodies, and "False Dawn" revels in its feedback loops. A complex and rather beguiling album.